I've been having vivid dreams lately. Some of them, I forgot to remember, but one stayed with me because what woke me up was Dolphy's funeral, which was a huge part of the dream. The dream was a little dark. Let me type it here before I forget. One of my friends, Marchie, had befriended a stranger. He was in his late forties, a mysterious but pleasant man who had a tired and weathered look about him. Marchie introduced him to me and my best friend Sherwil, and we started talking about nice places to visit in the city. He was Filipino, but he said he hadn't been around Manila much. We were making plans with him outside my office building when an unmarked police car came to pick him up. We were then told that he was under the witness protection program, and it was finally time for him to testify against a controversial and powerful criminal. I could tell he didn't want to go, but he entered the car, a picture of surrender. Somehow I knew I'd never see him again, and part of me wondered if I should be more disturbed even if I really had just met him. I wondered how Marchie felt, since he was her friend. I also wondered if I should feel bad for Marchie, because she was my friend. As the police car was getting ready to go, we suddenly heard a loud crashing sound from the corner. There were no screams or any succeeding commotion, just that one loud crashing sound, but I went to check anyway. I saw a group of uniformed policemen and traffic enforcers huddled near a big truck, in front of which a dead man lay face on the ground. He had obviously been hit, and for a moment nobody moved to check for identification, leaving him a dead stranger. 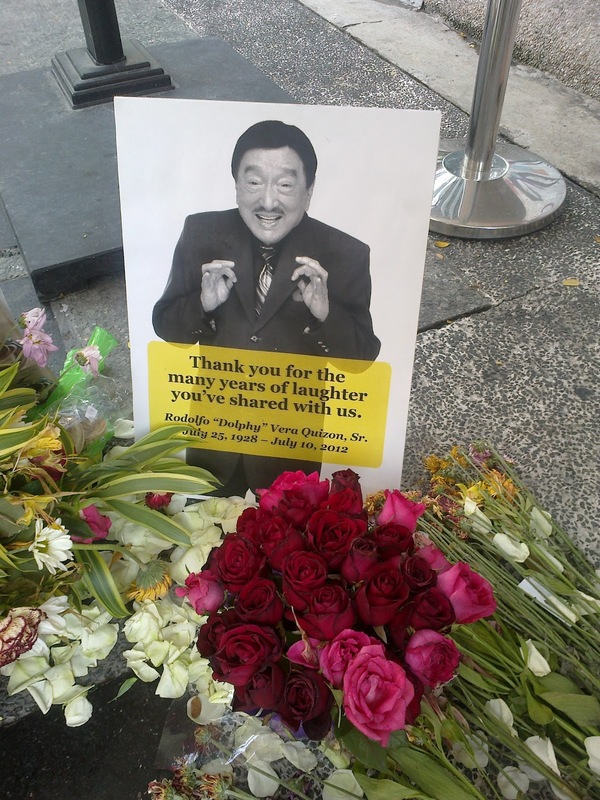 The truck driver was saying something about Dolphy's funeral. Somehow, I also knew that the dead man had been trying to get to a TV to catch the funeral. I called Sherwil to tell her what had happened, and we talked about how Dolphy's funeral was just about to start. We wondered if the comedian's death had descended like a Pacquiao fight upon the nation. Perhaps people were rushing to say goodbye to the comedian, perhaps his passing had somehow interfered with everyone's usual programming that people weren't paying their usual amount of attention to their everyday things? -- and then I was awake, discovering that I had left the TV on and it was showing TV5's live coverage of Dolphy's funeral. His family and friends had just released several doves to the tune of Rent's "Seasons of Love." I think it was the sounds of the doves being released that became explosions in my dream. Death has been on my mind lately. I think it's because I now know three young people who I've seen at their most exuberant best who passed away unexpectedly, and this, coupled with the passing of many of my generation's icons, has left me looking at my own mortality. I wouldn't call myself a fan of Dolphy, but he was much a part of my life, thanks in part to limited free TV channel options and a household that only had one TV. I grew up on John En Marsha and, later, saw my sister grow up on Home Along Da Riles. I was sad when he was dying, and I was surprised that I cried when I heard he had died. 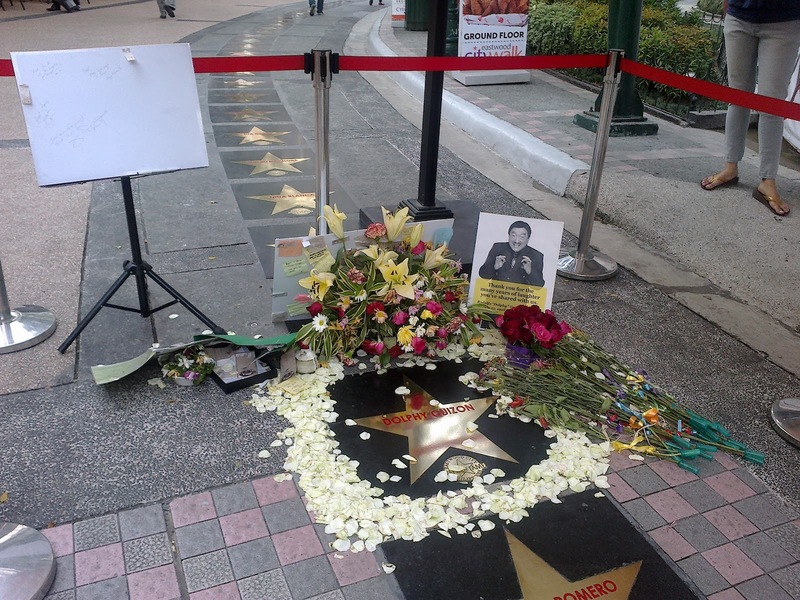 I took pictures of his star on Eastwood City's Walk of Fame. 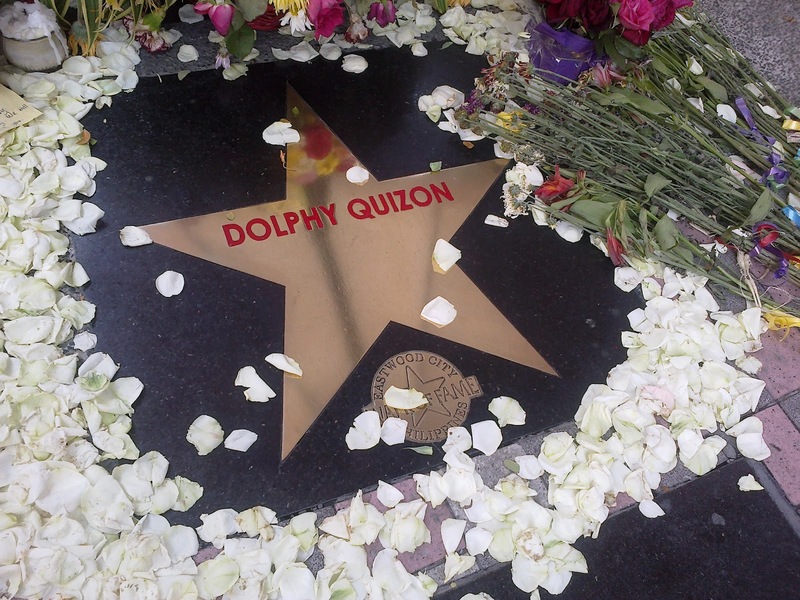 Dolphy's star the day after he died. I'm not sure who put this picture there.